It seems as though everywhere I turn, I see photos of the poppy installation in the moat of the Tower of London. It was done to commemorate the lives of the almost 900,000 UK men whose lives were lost during World War I.
I know I'm supposed to look at this display-- which has been creating nightmarish crowds in London-- and see how beautiful it is. 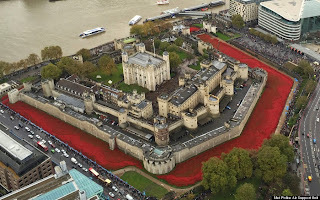 How the red of the ceramic poppies is so brilliant and striking. But I can't. All I can see, before tears fill my eyes, is a moat filled with blood. The blood of hundreds of thousands of men whose lives were so senselessly lost in a war from which Great Britain never recovered. On a brighter note-- let's not waste these links! Historical mystery writer Patricia Bracewell has written (and photographed) the two weeks she spent as Writer-in-Residence at Gladstone's Library in Hawarden, Wales. Netflix will be filming a series based on Lemony Snicket's A Series of Unfortunate Events. Can books spark intimacy between lovers? A forgotten John Steinbeck story is being published after 70 years. In honor of Veterans Day/Remembrance Day, read why Stornoway deserves special recognition during the UK commemorations. If literary characters were lifestyle bloggers. The book Paying for the Past reveals a link to an infamous fraud case in the UK. As researchers become more skilled in capturing and banding hummingbirds, we're learning more about the life span and travels of these tiny creatures. Happy 100th Birthday to Hedy Lamarr, a movie star who paved the way for Wi-Fi. Do you read eBooks on your Smartphone simply because it's always available? Yes, there are benefits to having an eReader! HarperCollins is releasing an enhanced eBook edition of To Kill a Mockingbird. The military no longer controls Myanmar, and the country's love of literature is reviving. Here's the scientific reason why you can get lost in a book. Supercomputing comes to the world of genealogy. Not many one-year-olds can boast that they fought off fourteen lions, but Hercules can! An amphibious "sea monster" discovered in China could very well be a missing piece of the evolutionary puzzle. Researchers have discovered a shipwreck in Monterey Bay. Witch marks have been discovered in the floorboards of a 17th-century English house. Dinosaurs had feathers long before any of them could fly, and now scientists know why. Archaeologists have discovered a Roman pond in a West Sussex village. Scientists are busy examining mysterious tar mounds in the deep ocean off the coast of West Africa. A new gas pipeline is being laid in Belgium, uncovering the largest ever World War I excavation. 350-year-old high heels, tea, and goblets have been unearthed at an Irish castle. A bronze bell from a long-lost Arctic shipwreck has been found. A skeleton uncovered in the huge burial tomb of Amphipolis in Greece may finally reveal for whom the vast complex was built. 28 books that shaped Bruce Springsteen's mind and music. 17 writers on the importance of reading. 6 gift ideas for the eReader who has everything. The young folks in your life will probably love the Baa-Baa Book Shelf. How about some literary jewelry? That's all for now. 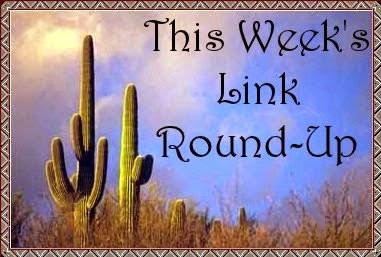 Don't forget to stop by next Friday when I'll be sharing a freshly selected batch of links for your surfing pleasure. Have a great weekend! Cathy - We never do seem to learn, do we. It's just heartbreaking to think of all of that loss... But I do appreciate these great links. We are learning so much from those digs people are doing. And it's good to hear that Myanmar is reviving its literary life. I think, of all the links, the one about Myanmar really made me smile!